“Having an intention is really important. The intention [of The Radio Stuff Podcast] was and is to connect radio lovers around the world and share great ideas and be as positive about the radio industry as we can. It’s really about following our curiosities and talking to interesting people.” Larry Gifford. This section asks you to identify the purpose of your podcast. If you like, leave it for now and come back once you have read the rest of the book. The purpose will always be central to whatever you do. Every ten years, the BBC re-applies for permission to continue broadcasting. The process to keep or renew the Royal Charter begins with one question; what is the purpose of the BBC? When the new charter is published, the first few words will describe the purpose of the BBC. While the BBC is a massive global organisation and your idea for a podcast might be for just and a few friends or colleagues, it is good practice to be clear about the purpose. It is also important to plan the whole production process. Once you have decided, and everyone who is going to participate agrees what the purpose of the podcast is, then write it down. Try to write the purpose in 140 characters ready to post on Twitter. Larry Gifford (@giffordtweet) has had an extensive radio career in the USA and now in Canada. He has been an on-air personality, journalist, sports reporter, programmer and manager at ESPN, Fox Sports Radio, and news, talk, and sports stations in Los Angeles, Philadelphia, Seattle, Columbus and Dayton. He also makes The Radio Stuff podcast. He says that having an intention is really important. “From early on when we were figuring out what the Radio Stuff podcast would be, we realised there were so many great ideas from just the small group of people we knew in radio. And we loved talking radio with our radio friends. We thought: why not share ideas about radio globally, when we can do that with the podcast? Malachi O’Doherty describes himself with typical modesty as an old radio hand. “The trouble is,” he says. “As you grow older and try other things you become a writer, you become a photographer, a broadcaster, a commentator, a reporter, a teacher. But I like the description old radio hand.” Malachi is one of the best known journalists in Northern Ireland. He writes and makes radio programmes about politics, religion and faith, history, arts, literature. He is also one of the earliest adaptors of digital media among the journalists that I know and has been making his interviews and audio available to anyone online for decades, pre-iTunes, pre-podcasting, pre-Facebook. He began this journey when he realised that long interviews were being stripped down to a couple of minutes for the radio packages he was making. Yet, all of the interview was interesting and potentially valuable to other people who might want to hear more from the interviewee. Malachi had identified – before any of us had heard of the concept – the “Long Tail” value of interviews and how the web can be used to capitalise on that Long Tail. “I recorded audio and put it on the internet. It was as elementary as that. The first impulse was to put the recordings online so people could access them.” Having used perhaps two minutes of a thirty minute interview, the full interview could be put online as a resource. Being old radio hands, both of us, we were trained to measure the audience and to ask “How many are listening?” Yet the value is not always in just the numbers; it is in who is listening and how they engage with your podcast. You can hear the interview Malachi on the blog . There must be common purpose. Discuss the whole project with the team so everyone buys into the idea. Even if you are a one person operation – many podcasters are – you should still think this through for yourself. And yes, write it down and every few weeks, re-read the purpose and ask, “Is this what I am doing”. If you are part of a team, meet regularly and from time to time review your purpose. Is that what you are doing? Should you change? As other volunteers join your team you can talk to them about the purpose and describe what it is you are all trying to achieve together. The purpose can change over time as you learn more about producing your podcast and about the listeners. It is not smart to stick to what was once a good idea which everyone now hates. Try not to change too frequently, though. The people working on the podcast, and just as importantly the listeners, will want a degree of consistency. You might change the format of your programme, but it is unlikely you will change the editorial direction. 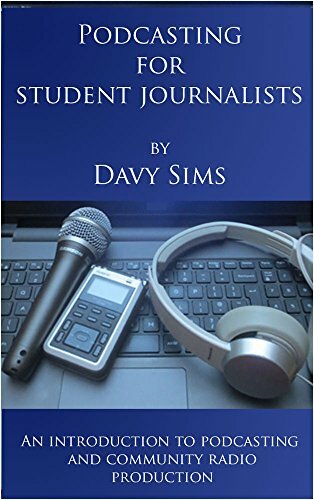 Developing professional skills: In Chapter 2 of the Podcasting for Journalism Students, I talk about all the various roles people can play producing a podcast, the editor, the researcher, the writers, the presenters and the others. People taking up these roles will be learning new skills; they may be working in a team for the first time. Perhaps even they will be taking on responsibilities for the first time. Your team will may well be self-taught or learn through group work. People will learn and change. Perhaps the purpose of the podcast is to help people gain confidence and the number of listeners, beyond your own group, is unimportant. No matter, people will learn and grow and come away with new skills and possibility an eagerness to learn more. Reporting stories from your community: Whether it is the college community or the community the college is part of, this ultra-local journalism can have real value to audience and production team. News about college events: Not just sports reports and concert reviews – there is nothing wrong with either. What are the real issues to do with college, further education, student politics, broader events that impact on student and college life? Campaigning: Students are more likely to be attracted to issues like human rights and environment the party politics. What do you and your colleagues want to campaign about? Connecting: Podcasting puts you on a global stage. You can use it to connect with proper, groups and issues around the world. To inform the influencers: Who are the people who really need to know what you and your team are up to? Politicians, decision makers, grant making bodies, local businesses who you want to recruit as supporters and funders. You might want to change government policy. There might be something going on that concerns the community and you want to bring that to the attention of people who will do something about it. You might want to campaign for change. These are all vital community exercises and a podcast – while it will not fix a problem alone – is one of the tools you can use to influence other people. Reaching mainstream media: You can reach a broader audience if you connect with the mainstream radio, TV and newspapers. To become and influencer: A podcast is a platform. Make it good, get listeners and people supporting you and in time you too may become an “influencer”. You and your team’s podcast might be the change you want to see. A radio programme, a podcast, a website cannot be produced by committee. Well, it can be, but it is destined for failure if it is. One person must take the lead and make the vision a reality. Even if you are working alone, decide what the purpose is, it will be your guide, your reference point. Don’t be afraid to review and change if you need to. What’s the point, eh? What’s the point of going through the whole, sometimes demanding process to produce your podcast, to manage the people involved and to continue the conversations once the podcast is posted? Because posting the podcast might well only be the beginning. Who do you want to talk to and what do you know about them, what do they like and not like, how they spend their time, what gets them motivated? Why do you want to attract their attention and take up their time? What do you want them to do after they have listened to the podcast? You need to understand your audience. Producing a podcast means you do not have to go to an existing radio station, television channel or newspaper to reach an audience. For generations people working in mainstream media have been the gate keepers. The best you could hope for is getting past the gatekeeper and speak to their audience. And their audience might not be precisely the audience you want to speak to. By producing your own podcast, you get the chance to develop your own audience. You should not think of the audience as “everybody”; that can quickly become “nobody”. Have a very clear idea of who your audience is to be. That will help you write your scripts, cut your reports and present your podcast because your audience will be in your mind throughout the production process. What is it that you are bursting to say to this audience? Think about the stories you want to tell. You will be working to develop and keep an audience, so what sort of conversations do you want to have with them? That word “conversation” means that you also need to listen to your audience. How do you do that? How will you incorporate your listeners’ thoughts and ideas into the podcast – or community radio programme? Broadcasting has changed. Social media have led that change. We are now able more easily to narrow the audience – narrowcast rather than broadcast – and involve the audience. The podcast is as much an opportunity to listen as it is to speak. Or if you prefer, “How do you want to say it?” Later in this book we will discuss a range of different production styles and techniques; interviews, written pieces, packages, two-ways, three-ways and more. The editorial thread running through them all, will be the house style you will develop. There might be humour, there might be varying degrees of formality. Your presenters might use an easy approach to language where slang where “four letter words” are acceptable, even expected. You will develop the right style over time with feedback from the audience and reviewing your work regularly. Begin by identifying your purpose. Then write it down“The purpose of this podcast is …”. Keep it to two supermarket queue style sentences. In other words, if you were in a queue at the checkout at a supermarket and you met someone who asked what you were up to, have a two-sentence explanation of your podcast and what you want to achieve. Then write it again in social media style. Write it in 140 characters or fewer. Tweet it, make a poster, send it out as greetings cards. Make sure everyone involved knows what the purpose is, that they agree on what it is and are prepared to review that purpose a little further down the line. Next, identify your audience, who they are and what you know about them, what it is you want to say to them and how you are going to say it. With that done, you are ready to start building the production team. You can’t make radio without listening to radio. For more, follow the production course category.